I began this week of flower photos with an orchid, so I will conclude this little series of flower photos with this photo of some wild orchids. This week we have photos of the Patagonia region of Argentina posted on our Viva la Voyage travel photo site. This is a more typical ginger flower than the one I showed yesterday. Although I took this photo in the central highlands, we do have ginger flowers in Tamarindo. They do not grow wild in the dry coastal forests around Tamarindo, but they grow in gardens where they receive watering. We have them growing around our condos, as developers, landscapers, hotels and restaurants like to add tropical flair and color to the plant life. I cam across this flower during a hike in the rain forest in the highlands above San Jose. It appears to be a ginger flower that sent off a shoot, and the petals on the shoot have mostly fallen away. Normally ginger flowers are more compact, as I will show tomorrow, so this may be a different variation. This is a macro of the inside of the flower that I showed yesterday. It is rather simple in structure. Tomorrow I will show a more complex flower. These flowers hang upside down. My own assumption, which is not supported by any knowledge of botany, is that this is an example of evolution in plant life. These flowers grow in the cloud forest and rain forest highland areas of Costa Rica. If these large bell shaped flowers grew right side up, they would fill will water many times heavier than their ability to remain upright. Orchids do not grow wild in our pat of Costa Rica because our climate is too dry much of the year. In the central highlands and cloud forests, however, orchids are prolific and varied. This photo gives a good view of the entire body of a margay. Its distinctive brown leopard-like spots are distinctive. Adult margays range from 19-31 inches (48 - 79 cm) in body length, plus a tail of 13-20 inches (33-52 cm). Margays are expert climbers and may live their entire life in trees, jumping from one branch to another with a leaping range of about 12 feet (3.7 m). Today is Sunday, so we have new photos posted on our Viva la Voyage travel photo site. This week we are showing scenes from Patagonia in Argentina. This is a margay in the rescue shelter of the La Paz Waterfall Gardens. The resemblance to house cats that was apparent in the photo that I showed yesterday is even more evident in this photo. 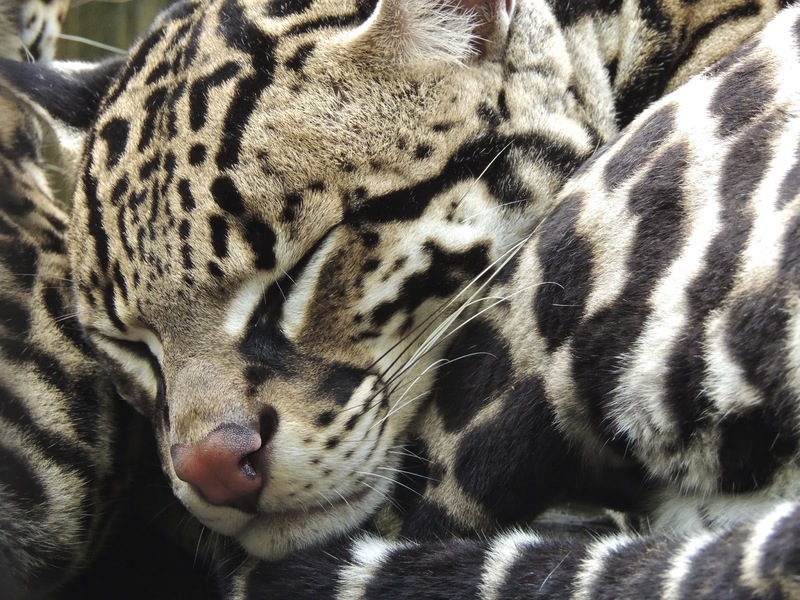 Margays are native to Central America. Their habitat stretches from Mexico to Argentina. 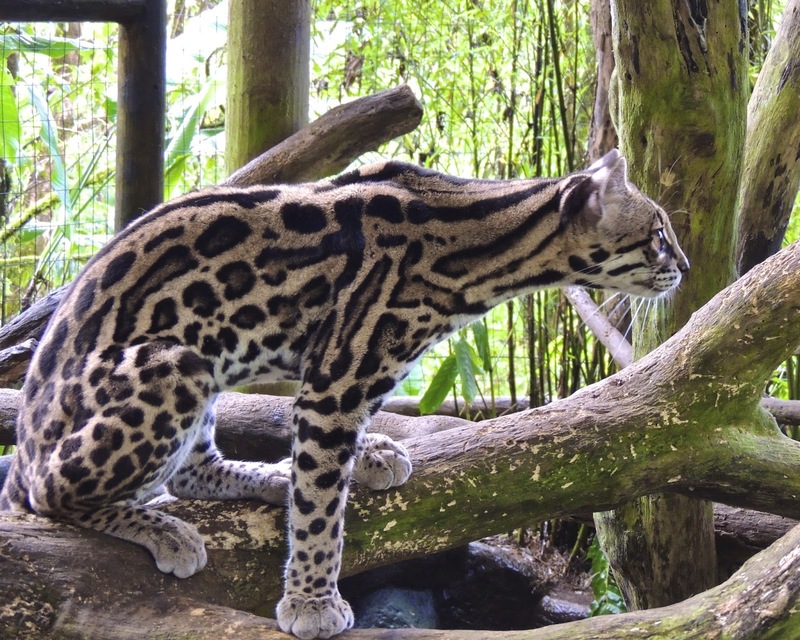 They are not endangered, but the are considered near to being threatened because of loss of habitat and people kill about 14,000 margays per year because of their attractive coats of fur. Tomorrow I will show a full body profile of a margay and will provide more information about them. This week we are showing photos of the Galapagos Islands on our Viva la Voyage travel photo site. This is not a house cat. It is a member of the cat family, of course, and it is displaying a common trait of cats -- taking a cat nap. Tomorrow and the next day I will show more of this magnificent creature and will provide additional information about it. The expanded use of no smoking areas has also resulted in some places set aside as designated smoking area. This is the smoking area outside the Marriott Hotel in San Jose. My brother used to work at a hospital in northern Minnesota that provided for the only smoking area to be on the loading dock next to the garbage bins. My brother commented that the sight of people standing outdoors in the freezing Minnesota winters, next to garbage bins, is proof that smoking is addictive, as that could not be a pleasant experience. One can often pick up bits and pieces of a foreign language from signs and advertisements while traveling. This ad is instructive in teaching the language of cows in Costa Rica. These flowers were perched above a rushing river on a cliff at the La Paz Waterfall Gardens outside San Jose. I like the atmosphere of this tree silhouetted against the mist. I took this photo in one of the central valleys near San Jose. 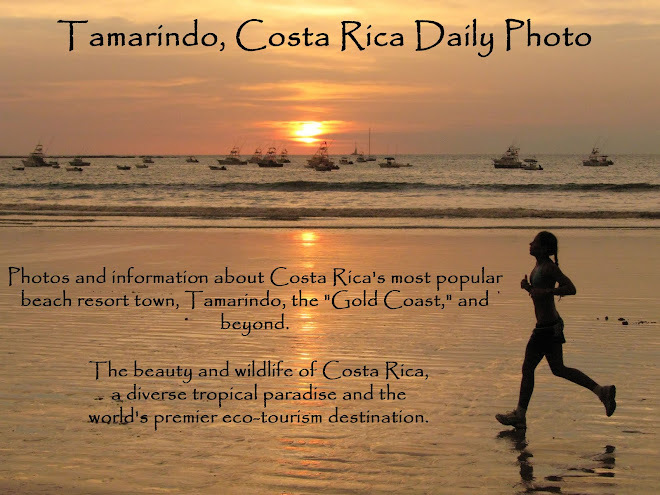 We don't have rain forests near Tamarindo. Northwest Costa Rica is a coastal dry forest. The rain forests in the central highlands begin about 90 minutes away. 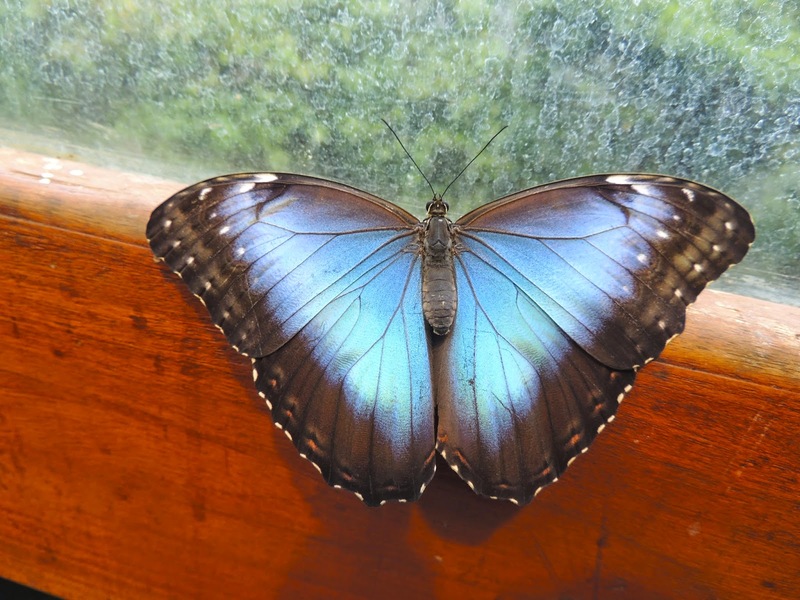 The giant blue morpho butterfly is a treat. Their neon aqua coloration is striking. Today is Sunday, so we have new photos posted on our Viva la Voyage travel photo site. This week we are showing some additional photos form out visit to the Galapagos Islands several months ago. Taking photos of butterflies normally involves the challenge of defining them, and then snapping the shutter at just the right time to catch their wings while the wings are open, as the tops of their wings are much more colorful than the underside that shows when the wings are closed. In today's photo, I happened to be able to catch two butterflies at the right moment int he same photo. Adding this element of sport to photography makes it a more interesting hobby, IMHO. Tomorrow I will conclude this butterfly series with what many would consider to be the most attractive butterfly species. This week we are showing photos of Dublin, Ireland, on our Viva la Voyage travel photo site. Taking a photo of a butterfly in flight is next to impossible, at least for me. The best I can do as far as an action shot is to catch a butterfly as it comes in for a landing. Actually, I can do a little better, as tomorrow's photo will show. I do not profess to have a good sense of color coordination. I don't think that orange and lavender is a color combination that one sees very often. 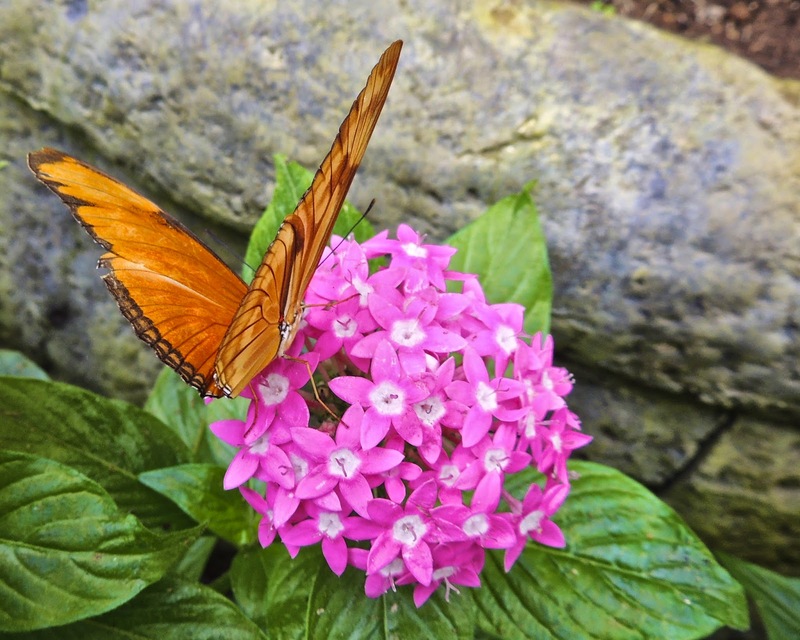 Perhaps the butterfly in this photo is a typical male and is asking his wife "Does this flower go with the color of my wings?" 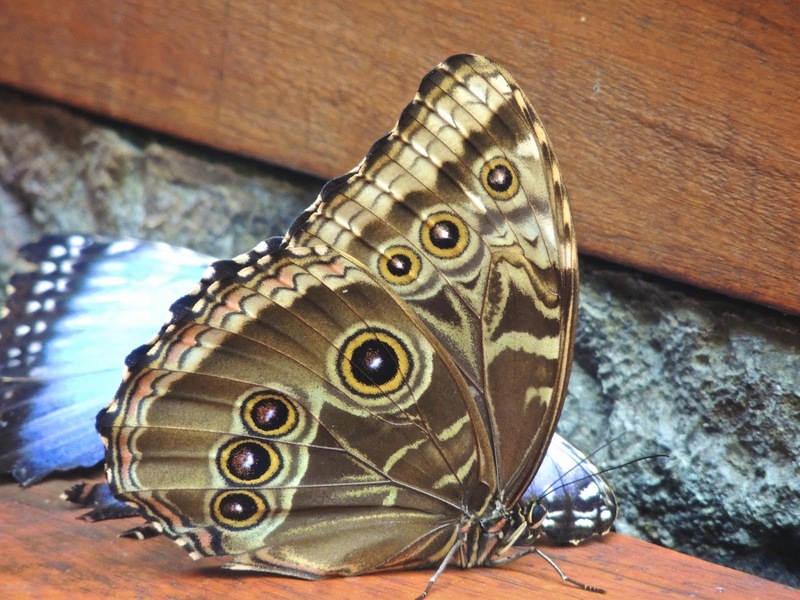 Some butterflies have large round circles on their wings. they do thais as a false eye. The evolutionary theory bend this coloration pattern is that the false eye gives the appearance to birds or other predators that the eye is on its wings. 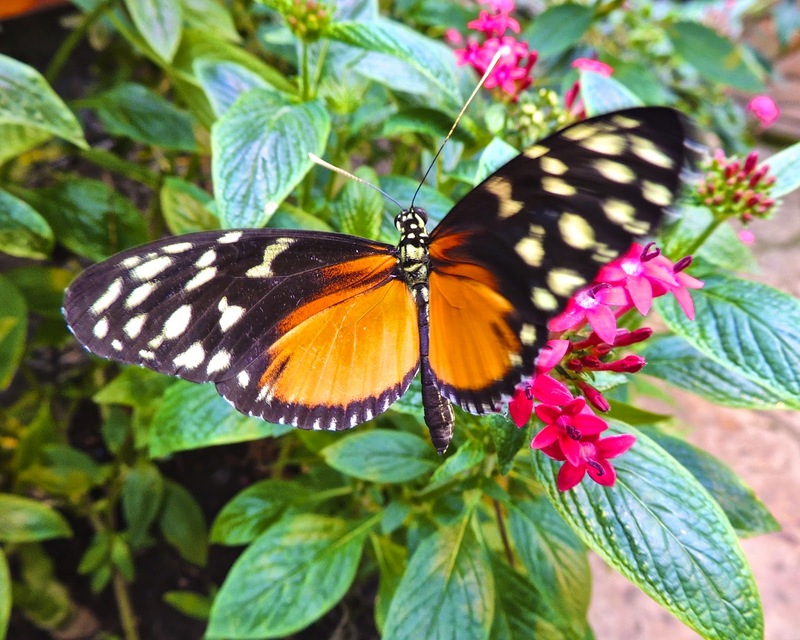 If the predator attacks the eye, the butterfly may still be able to escape with only a damaged wing. I would think that birds would be smart enough to figure out which is the ight end of the butterfly to attack. Maybe this false eye ruse works only on reptiles, as they appear to be a lot less clever than birds. After showing photos recently of leaf cutter ants and their den, I fought I should start a little series of some of the more attractive members of the insect world, starting with this classic Monarch butterfly. This is another photo of the trails through the grass at the Intel plant in San Jose made by leaf cutter ants. This shows one of the burrows, and the trail leading away from it. The leaf cutter ants bring back leaves, of course, not grass. So why would they chew the grass to cut it down to the dirt? My presumption is that they are making it a lot easier for themselves to walk back to their den along the bare ground rather than having to climb through the stalks of grass. It would be particularly strenuous to walk through the gras carrying large leaves on their backs. This is similar to building a paved road. They are pretty smart for having only an ant-sized brain. This is a blue jeans frog hiding in the rain forest. He gets his names, of course, from the distinctly blue color of his legs. 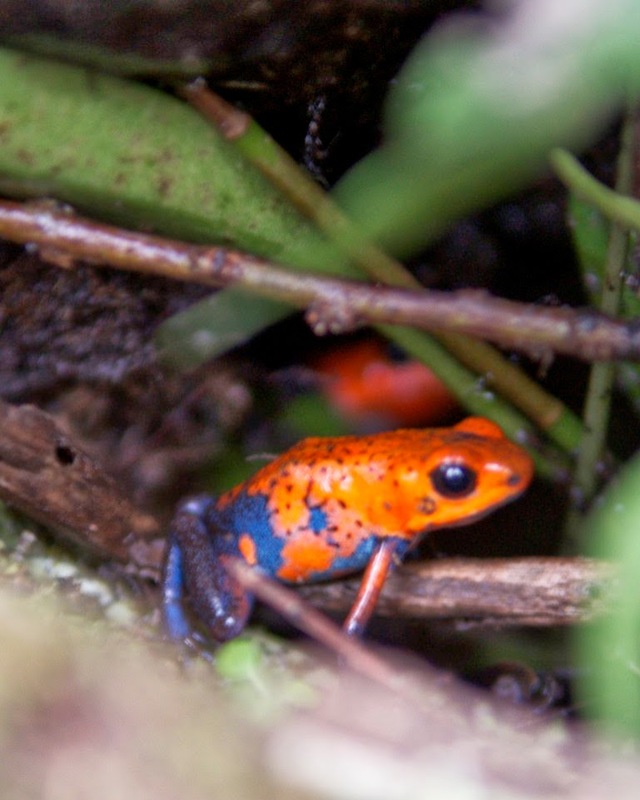 Of course it would make just as much sense to have named him red shirt frog. Today is Sunday, so we have new photos posted on our Viva la Voyage travel photo site. This week we are showing photos from Dublin, Ireland, featuring some of the public art and architecture. As a contrast to the Metropolitan Cathedral in San Jose, which I have shown during the past week or so, today I am showing a photo of the main church in downtown Liberia. Liberia is the capitol of Guanacaste province, the area of northwest Costa Rica where Tamarindo and other beach resorts are located. It has a population of more than 60,000 and an international airport. 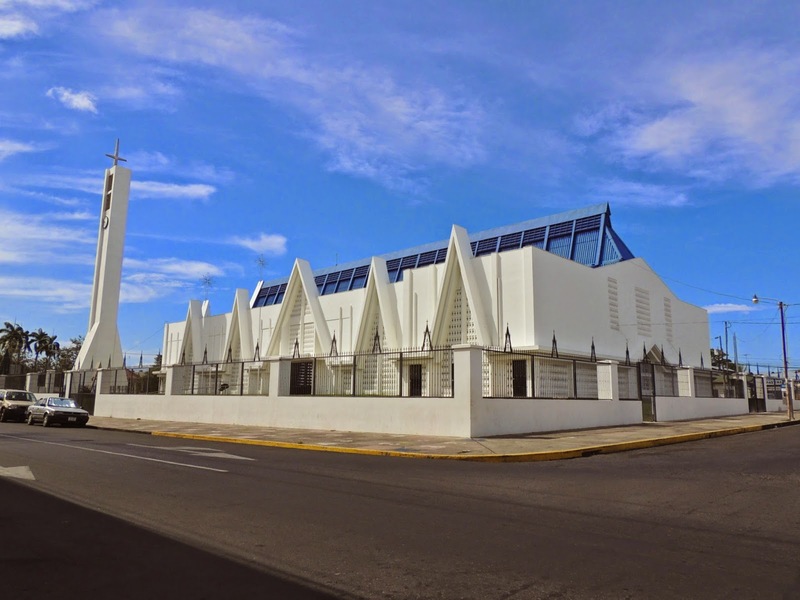 This is a large church by Costa Rican standards. It has an attractive, modern design. Most churches in Costa Rica are rather modes, small town and village charges. 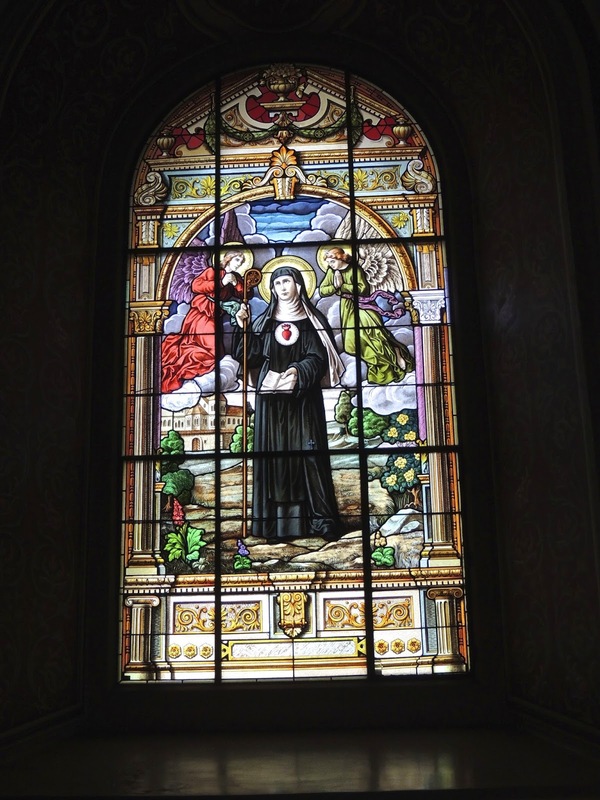 This week we have photos of Vienna, Austria, posted on our Viva la Voyage travel photo site. This is the front of the Metropolitan Cathedral in downtown San Jose. The main city square is behind the trees on the right. 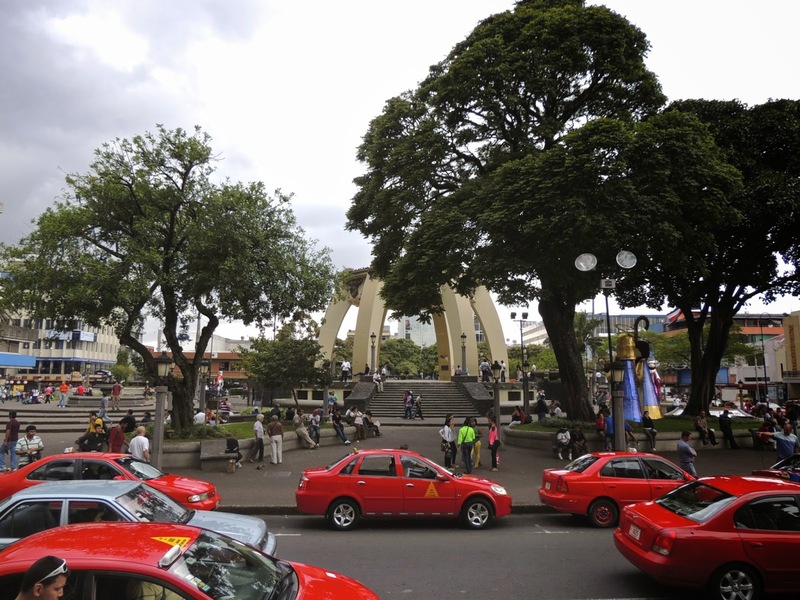 As the buildings in the background suggest, most of San Jose consists of 20th century commercial buildings that make San Jose not a major tourist attraction despite the fact that it is by far the largest city in the country. On our first visit to Costa Rica nearly 10 years ago, we took a tour by a leading U.S. travel company. The tour started in a suburban San Jose hotel, and left the next morning for Monteverde and Arenal, without even going into the city. I am sorry that it was a very overcast late afternoon when I was there, so the photo lacks the vibrancy and contrast of better weather. 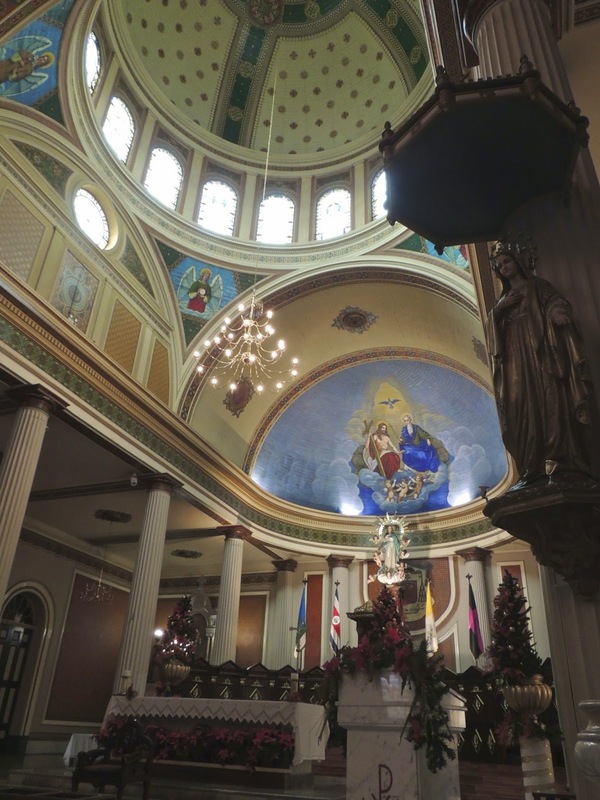 The Metropolitan Cathedral is one of only two churches in Costa Rica with which I am familiar that is notable for classic religious art and architecture. 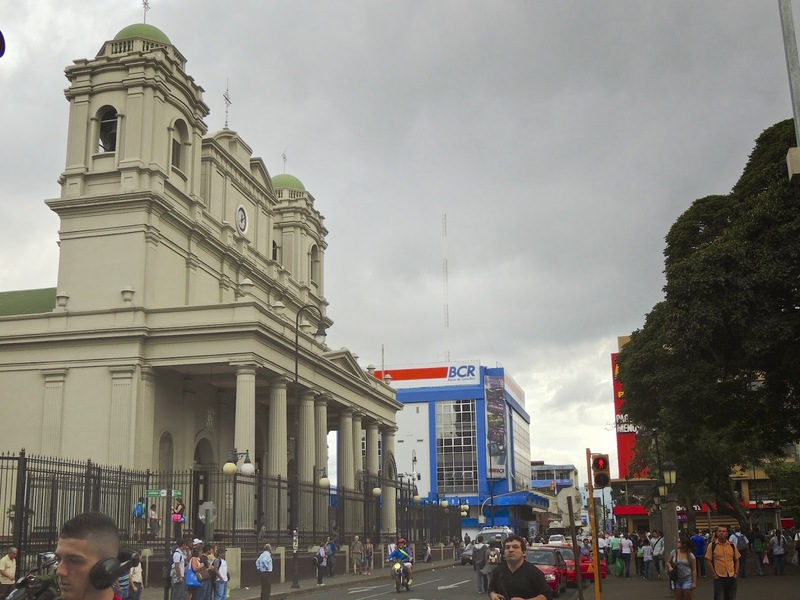 The other one is the Basilica de Nuestra Senora de Los Angeles in Cartago, which was the colonial capitol. I have shown it in the past. It is the most important church in the country and is the site of pilgrimages that are joined at times by as may as one-fourth of the countries population of about 4 million people. I have shown it in the past on this website. 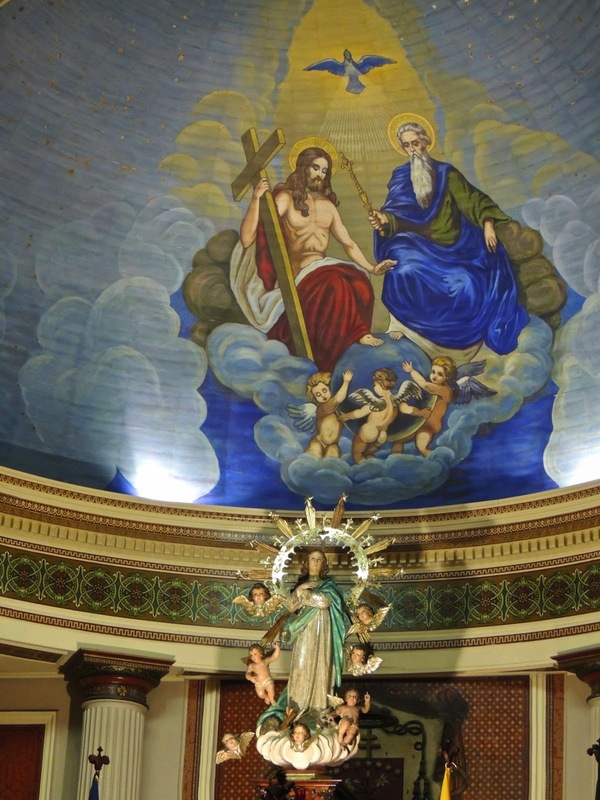 The area above the altar of the Metropolitan Cathedral features traditional Roman Catholic imagery, with artistry that one might expect of churches in Italy or Spain rather than Costa Rica. 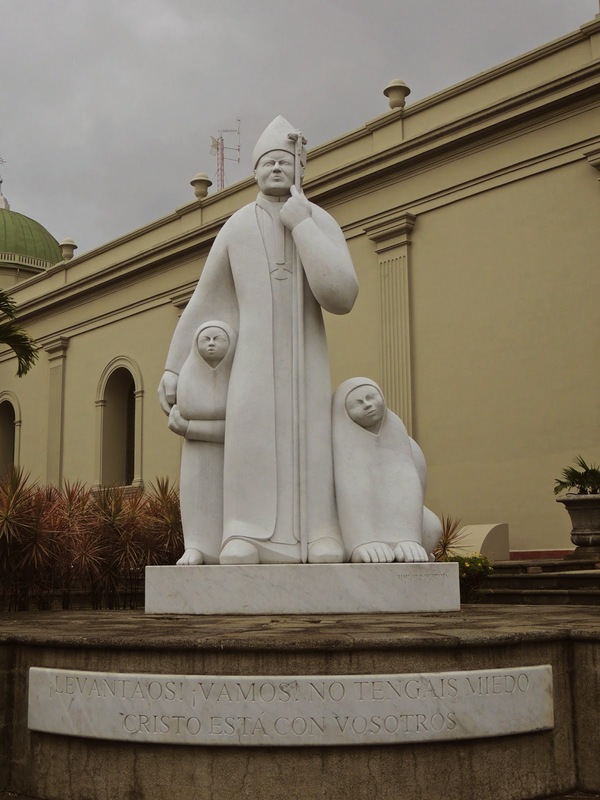 Costa Rica grew as a nation of small family farms, largely ignored by Spanish colonial rulers, with the population scattered in villages and small towns in the country side, so there are not many large churches, unlike other Latin American countries such as Mexico. 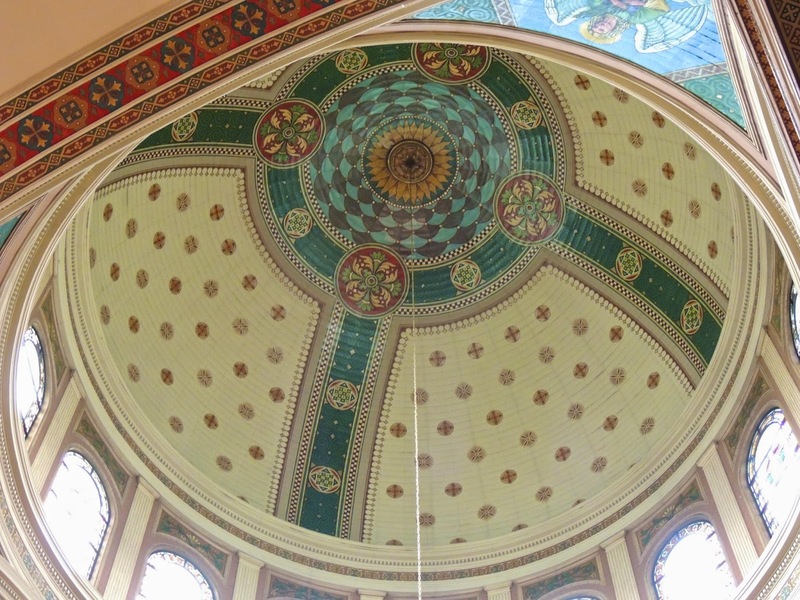 This is the interior of the dome of the Metropolitan Cathedral in San Jose. 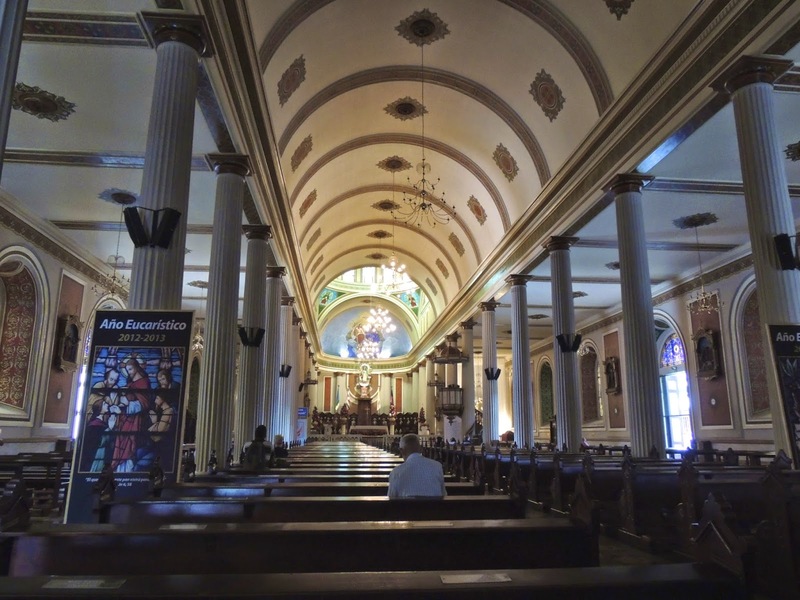 It is unusual to see ornate church interiors in Costa Rica. The National Cathedral was built in the 1870, replacing an 1802 predecessor that was destroyed in an earthquake. This is a view of the front of the National Cathedral. I will show closer views of some of its elements in the next few days. Today is Sunday, so we have new photos posted on our Viva la Voyage travel photo site. This week we are showing photos of Vienna, Austria. Because I showed a photo from the steps of the National Cathedral, I will do a little series of photos from the interior. This will give a perspective of the size of the cathedral. It has a Greek Revival style, with the many pillars to support the roof. This week we have photos of the architecture of Portugal posted on our Viva la Voyage travel photo site. This is an alternative choice that I had considered for yesterday's May 1 theme of "squares." 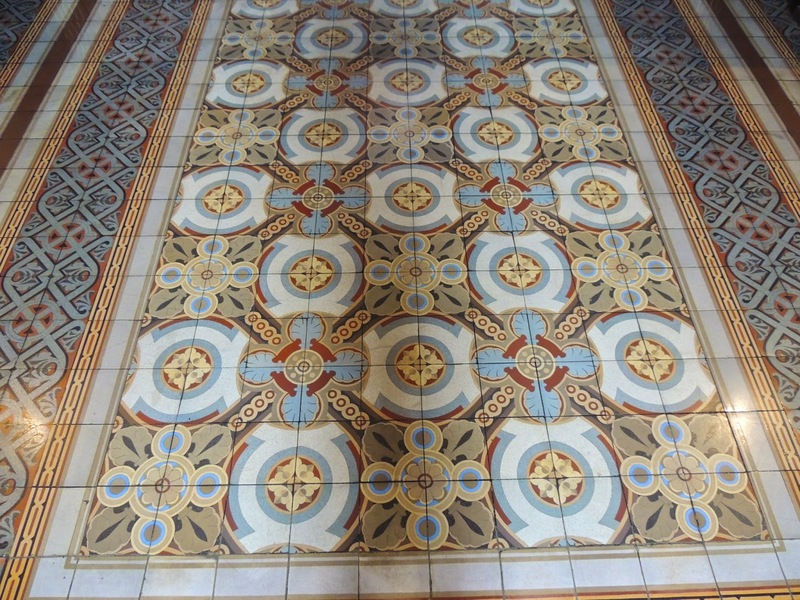 It is a section of the tile floor of the National Cathedral on the main square of downtown San Jose. For today's worldwide City Daily Photo theme of "squares" I chose this photo of the main square in downtown San Jose. I took this photo from the steps of the National Cathedral. The concrete gazebo is in the square and, I assume, is a venue for events. There are lots of red taxicabs in the foreground. I had considered using the square at the top of the bridge I posted yesterday for the theme, but chose this different type of square instead. To see how other City Daily Photo bloggers have interpreted the theme, use this link.